Dublin – 5 February 2013 – Gaelchultúr has sent the Irish rugby and soccer teams an iPhone App for free to help them learn Amhrán na bhFiann in time for the England and Poland matches this week. The Amhrán na bhFiann app teaches the national anthem karaoke-style, line by line. Players and supporters now have no excuse for mumbling their way through the anthem! With the Amhrán na bhFiann app, the Irish rugby and soccer national team players can first of all learn the words, then the tune and finally try singing it themselves. It also includes a quiz about the anthem, full of interesting facts. Did you know, for example, that Amhrán na bhFiann was originally written in English? Or that it was in 1998 that RTÉ stopped playing Amhrán na bhFiann at the end of the day’s broadcasting? A full English translation of the words of Amhrán na bhFiann is also included. About the Amhrán na bhFiann App The Amhrán na bhFiann app is available in the App Store by searching for “Irish National Anthem”. It costs 89c to download. Gaelchultúr has a limited number of apps available to journalists free of charge; please email darren@gaelchultur.com to get your free app. About Gaelchultúr (www.gaelchultur.com) Gaelchultúr is a Dublin-based company providing Irish language training and consultancy services to both the public and private sectors. Its goal is to offer first-class services that will inspire both learners and fluent speakers of Irish to improve their knowledge of the language. Gaelchultúr’s e-learning website, ranganna.com, was a recipient of the European Award for Languages, The European Language Label, in 2009. Gaelchultúr was awarded the status of registered provider of FETAC (Further Education and Training Awards Council) awards in 2011 and offers specialised FETAC accredited courses to public sector bodies. Dublin – 12 September 2012 – As part of its autumn programme of classes, Dublin-based company Gaelchultúr will be offering live online Irish classes that can accessed anywhere in the world by those with an internet connection. With a growing number of people learning Irish abroad, including more than 4,000 third level students in the USA and Canada, the demand for resources and a structured and innovative approach to teaching the language is greater than ever. “Classes will contain a maximum of fifteen people and the technology used will ensure learners gain optimum benefit from each session,” says Éamonn Ó Dónaill, Gaelchultúr’s Director of Education. “The lecturer will be visible on screen and he’ll have a wide selection of resources at his disposal, such as PowerPoint displays, videos, a whiteboard and audio files. Students can ask questions at any time and they’ll have access afterwards to a full recording of the class (both audio and video). This means they’ll be able to watch any class again whenever they’re online. Participants will not be required to download any software to take part in these classes – they will only need a computer, an internet connection and a head set. Learners can also use a camera if they wish. The live online classes will begin the week commencing 24 September 2012 and will be available at beginners level and lower intermediate level. Students will participate in a two-hour class once a week for ten weeks. In addition to the online classes, Gaelchultúr will also be running evening classes at its new centre on Clare Street in Dublin 2, as well as in Carlow, Cork and Limerick. Over 4,000 adults study Irish with Gaelchultúr each year, both online and in the classroom. Further information about Gaelchultúr’s range of courses is available at www.gaelchultur.com. Dublin - 15 November 2011 - Are you looking for a beginners Irish course which focuses primarily on the spoken word? Would you like to learn authentic everyday language? Do you want to find out how the language works without having to grapple with complicated grammatical explanations? Then, Gaelchultúr’s Gaeilge gan Stró! - Beginners Level, published this month, is just the course for you! This new multimedia course for adult learners of Irish, written by Éamonn Ó Dónaill, consists of a book and four audio CDs which are closely linked to the book and come free with it. The package costs €34.99 and is available for purchase on siopa.ie. An online version of the course will be available on Gaelchultúr’s e-learning website, ranganna.com, from mid-September. The book and audio CDs can be used independently of the online version of the course. Gaeilge gan Stró! – Beginners Level is aimed at those who have not previously studied Irish or who only know a few words of the language. The course is intended for learners working by themselves and seeks to give them the confidence and language skills necessary to communicate in Irish in everyday situations. The emphasis is on developing speaking and listening skills but learners are also given some opportunities to read and write the language. Grammar is taught in context, as it’s required. There are fifteen units in the course, focusing on core topics such as Work, Pastimes and Travel. There is a range of fun-to-do interactive activities, most of which require the learner to engage with the spoken language. Answers to these activities are given at the back of the book or on the accompanying CDs. The “Insight” section in each unit contains information about the history of Irish and about the language in contemporary society, while the “Useful tips for learners” section aims to help those studying Irish to do so more efficiently. “Gaeilge gan Stró! aims to help learners start speaking Irish immediately,” says Éamonn Ó Dónaill. “I’m confident that anyone who studies the course will be able to interact with speakers of Irish in a simple way in social settings and will understand a fair amount of spoken Irish. Éamonn Ó Dónaill is originally from the Gaoth Dobhair Gaeltacht in Donegal and has been teaching Irish to adults since 1981. He has written various books for learners and teachers, including Essential Irish Grammar (2008), Gramadach gan Stró! (2008) and Gaeilge gan Stró! – Lower Intermediate Level (2010). Éamonn has been working as Director of Education in Gaelchultúr since 2005. Dublin – 15 February 2011 – Enda Kenny, Micheál Martin and Eamon Gilmore have all been sent a free copy of QuickGuide Irish Grammar prior the TG4 debate on Wednesday night. This handy guide will help the leaders differentiate between correct and incorrect forms of Irish grammar and, most importantly, enable them to count properly in Irish, a skill that has been lacking in English recently. QuickGuide Irish Grammar is the first such resource available in Ireland and aims to simplify grammar for learners of all ages and political persuasions. This non-political guide draws attention to the importance of good grammar and spelling, e.g. the significance of including the síneadh fada in Fianna Fáil’s name. Gaelchultúr has sent the guide to the leaders of all the political parties and also to Dan Boyle who, commenting recently in the Seanad, said: “My concerns about making a speech like this in Irish are that issues such as tenses, plurals, the use of pronouns, the way the Irish language puts in letters just for the sake of it a lot of the time.” Hopefully this indispensable guide to Irish language grammar will help all politicians get their plurals and pronouns right. QuickGuide Irish Grammar is an easy-to-use resource which focuses on the main aspects of the grammar of the language. The unique design and colour scheme enable the user to find information quickly, and the jargon-free explanations make this an indispensable tool for both regular users of Irish and learners of the language. QuickGuide Irish Grammar is available to purchase on www.siopa.ie. 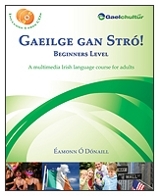 Published in January 2011, QuickGuide Irish Grammar is Gaelchultúr’s fastest-selling product. Gaelchultúr receives financial support from Foras na Gaeilge (www.gaeilge.ie). About Gaelchultúr (www.gaelchultur.com) Gaelchultúr provides Irish language training and consultancy services to both the public and private sectors. Its goal is to offer first-class services that will inspire both learners and fluent speakers of Irish to improve their knowledge of the language. Two of Gaelchultúr’s projects, ranganna.com and ClubLeabhar.com, have received the European Award for Languages, The European Language Label, in 2009 and 2010.